Hi My name is Brian Mahany, I am the founder and principal of MahanyLaw, a national boutique law firm that represents commercial borrowers. Unlike most lender liability lawyers that represent banks, we don’t. Our practice is geared towards borrowers. Hi My name is Brian Mahany, I am the founder and principal of MahanyLaw, a national boutique law firm that represents commercial borrowers and high net worth individuals. Hi My name is Brian Mahany, I am the founder and principal of MahanyLaw, a national boutique law firm that represents commercial borrowers. Noted whistleblower lawyer and syndicated blogger Brian Mahany explains why courts “seal” whistleblower cases and what it means for whistleblower protection. 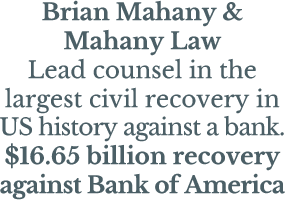 Noted legal author and attorney Brian Mahany, the lawyer whose recent $16.65 billion settlement against Bank of America was the largest in U.S. history, answers the question: Can You Sue Your Bank?